Ancient Medieval Coin from Frankish Period (Billon Denier. Guy de Lusignan, 1192-1194) demonstrating the use of RTI (Reflectance Transformation Imaging) on the website of Cypriot Medieval Coins, History and Culture. 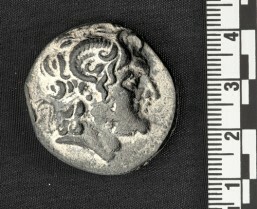 The use of RTI in the study of coins can provide the opportunity to identify surface details, inscriptions and decorative patterns invisible to the naked eye. RTI is a computational photography method that can provide outstanding high-fidelity photorealistic results in the documentation of surface textures. For works of art, RTI photography offers exceptional visual analysis of every surface relief detail providing great opportunities to revisit, challenge and revise old, as well as, new problems and phenomena in art history. This technology relies on extracting reflection information from several images of the same object lit from different angles. All images are captured from a fixed point within a “known” hemispherical coordinate lighting environment. These images are processed together with an algorithm that re-synthesizes the total reflection information into a new photorealistic representation. The final result has dynamic light properties, providing the user with the control of light on the surface of the photographed object. 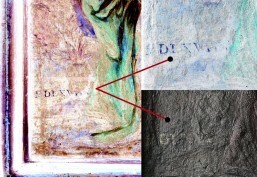 RTI images capture the surface texture of the painting panels, revealing impressive details of the artist’s painting technique and use of color pigments. El Greco Baptism of Christ. 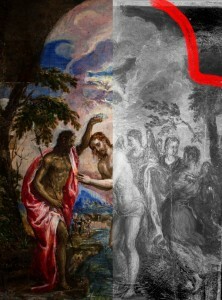 In the Heraklion Baptism of Christ painting, digital images demonstrate El Greco’s increased sensibility to the relief qualities of color pigment. He clearly utilized these attributes of his pigments to “mould” and animate parts of his composition. In addition, RTI images shed light on important details of the painting panel, such as the group of standing figures in the background setting of the represented scene, and the date in Latin numerals located in the lower left corner of the work. Furthermore, RTI documentation provides a detailed record of the state of preservation of the famous work that complements the analytical study of the painting led by the Benaki Museum and published in 2005. 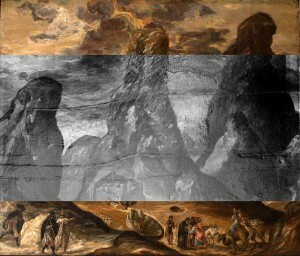 The analysis of the View of Mount Sinai painting with the use of RTI images reveals interesting details of El Greco’s work in the way he painted the overall representation of Mount Sinai’s landscape, as well as the various figures in the lower foreground of the painting. Such close visual analysis provides an opportunity to revisit issues of composition, perspective and synthesis as well as to continue probing questions regarding the artist’s inspiration and influences. Moreover these images offer a clear visual understanding of the preservation condition of the painting and the visible evidence of damage and deterioration that it has suffered over time. The imaging project was a collaborative effort between the Cyprus Institute’s ICACH (Imaging Center for Archaeology and Cultural Heritage) and the Historical Museum of Crete with the support of the European Project LinkSCEEM-2. Advances in imaging technologies and applications offer great potential for research as well as for the documentation and preservation of archaeological objects and works of art. In this context, continuous to develop a cutting edge imaging center that will spearhead its contribution in the study and protection of Cultural Heritage in Cyprus and the Eastern Mediterranean. This effort is possible within the activities of the LinkSCEEM2 project led by CyI’s CaSToRC researchers. The available imaging systems are not commercially available and were custom built to meet the needs of research in Cyprus and the region. The establishment of ICACH is materialized in collaboration with world leading experts from the University of Illinois at Urbana Champaign (UIUC) and the University of Southern California (USC) and supported by CyI’s wide network of local and international collaborators. An RTI dome which is an application of RTI photography and addresses the challenges of producing high quality digital records of the surfaces of archaeological objects and works of art. 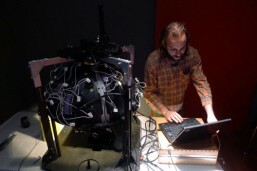 The second system concerns a domeless PTM system that can be used to create RTI images of larger objects and works of art. This technique is known as “highlight RTI”. A Large Format Photography unit customized in collaboration with the University of Southern California to address the challenges in the documentation of unique archaeological materials from Cyprus and the region. In particular, the system has been used to unwrap the cylindrical surfaces of ancient cylinder seals producing panoramic images with impressive detail resolution of up to 8,000 × 65,000 pixels.